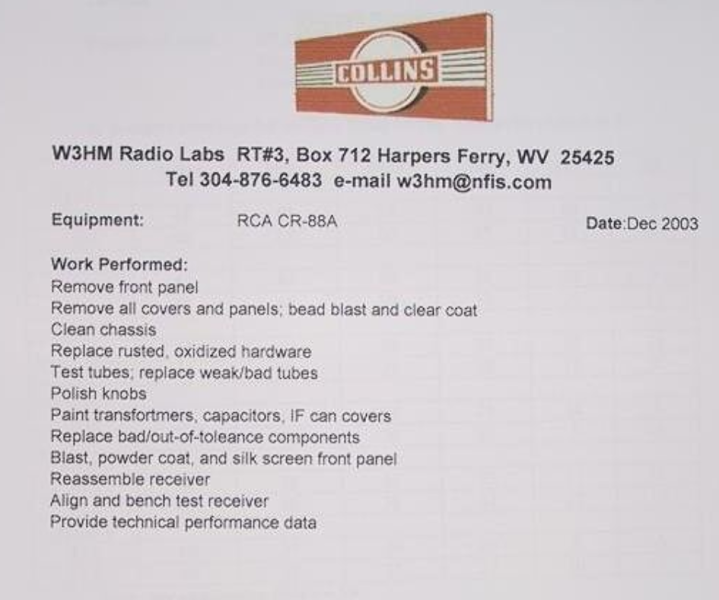 Antique Radio Forums • View topic - RCA AR-?? or CR-?? What is it that I've gotten myself into? Post subject: RCA AR-?? or CR-?? What is it that I've gotten myself into? Some more iron followed me home last weekend. It may be a CR-88 or CR-88A but you typically don't see them with the black panel. I've been in contact with Henry, WA7YBS, at radioblvd and he is a bit stumped also. Any guesses? Note the black IF transformer tops and silver cans. The tops appear to be original and not something someone painted. I'll also need a GOOD source for parts - need some dials and a couple other things. This looks to be an RCA AR88-D. I don't of anything in the AR88/CR91 series with an AM BCB bandswitch position except the AR88-D, but I am a long way from being an expert. My understanding (subject to being wrong.....) is that the "D's" were not a diversity receiver as this is. My thought is it may be an AR-88F which was a diversity receiver or a CR-88A. There are subtle differences between each model and this one but I have not been able to say for sure which it is. I don't see the tell-tale pattern of four tapped screw holes on the front panel that would mark a military receiver with its nameplate missing. I do see what looks like an RCA commercial nameplate on the removable RF Section cover. Could you get a better photo of that nameplate ?? Having dug a bit deeper, I think you may be correct. I had only ever known of the AR88D as having a BC band option, but apparently the "F", diversity receiver also receives the BC band. But did the "F" have crystal phasing? Could you get some photos, or high resolution scans of the obliterated nameplate ? Sometimes photoshop can do surprising things to a photo. Is there anything on your radio that points to it being from Canada? done with added silk screening on the panel but not RCA quality. of mods (usually for diversity). very intermittent and nearly impossible to repair. Les, my goal is to get it looking that pretty again! Well, the "wild guess" was not too far off. It got a refinish in black along with the transformer covers. I would put film capacitors in those oil filled ones because they will eventually leak and you will be hauling it to the bench cursing sometime in the future if you don't do it now. The chassis is cadmium plating over copper. Depending on how deep the rust pits are, you may want to think about having the whole thing replated. The copper is relatively cheap, not to sure about the cadmium and if there are many platers left doing cadmium. I hooked up with a guy in FL who occasionally lists AR-88 parts on E-bay, and he says he has a lot. Not sure about dials and the stuff that tends to go fast, but he hooked me up with a couple of critical parts. I have his private email address and can give it to you if you PM me. You would have had a heck of a lot less work with mine Tom, but I am now grateful I did not let it go and I will restore it.